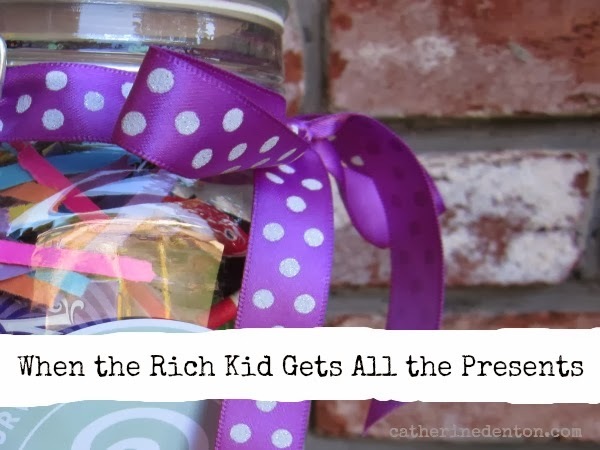 Have you ever sat at a birthday party, dinner party or outings with friends where one person seems to have it all? That kid always gets the latest gadget you want; or your neighbor always has the most updated revisions on their house; or your friend always seems one lucky step ahead in life. It's hard to stomach when you've only got five dollars to your name, or you just lost your job, or you don't have the support system they have. Probably most of us have been on the yucky side of that scenario. But could we also admit being on the other side? Most of us, in the states at least, have what we need. We have housing, food, and some amount of money. But when Christmas rolls around, we go insane. We make lists of stuff we want, we purchase stuff other people want, we send cards in maniac fashion and generally grab to get as much as we can. We're the rich kids stuffing our rooms with things we don't need while our neighbor, in a developing country, is hoping to have a meal that day. I think somewhere along the way our priorities got out of whack. I'm not saying there shouldn't be fun or celebrations, but how could we change them to be inclusive? Could we take the money we usually spend on people who probably have what they need, and send it to our neighbor? What if we gave of ourselves, to our families and friends, instead of buying stuff? We could give meaningful, homemade gifts, or a special time together, or make dinner. We could save our money and give it to the ones who really need it. I'll be posting more ideas on this throughout the month. I don't usually share many videos on my blog, but this one is so inspiring. It's my gift to you this season, enjoy! Excellent introduction to Advent Conspiracy. Also, your new website format is lovely and accessible. Love that photo of you with the book. :) It definitely reflects your personality and values. So much truth here, Catherine!